Most surprisingly, IBM will initially be using outside sources of software and plans to accept programs from private individuals — a huge departure from past IBM practices. The room was jammed. I was lucky to be up front; before me sat the demonstrator. His hands stretched across the keyboard as characters streamed onto the CRT display. It was a computer, a personal model for use in home or office. But it wasn’t just any new small computerâ€”this was an IBM. IBM entering the personal-computer business is like General Motors making motorized scootersâ€”you could bet America’s mode of transportation would be in for a radical change. This may be the beginning of the long-forecast personal-computer explosion. IBM. Saying “IBM” is about the same as saying “computer.” IBM got that reputation through strong products and smart marketing. It will keep that reputation with this personal computer. It’s not cheap, but it’s competitively priced. For $1,565 you get a basic model. You supply the TV set for viewing data and a cassette recorder for saving it. IBM supplies the multi-function keyboard (63 standard character keys, 10 numeric-entry keys, 10 special-function keys) and a system box, which comprises the microprocessor, 16 K (kilobytes) of user RAM memory, and 40 K of permanent ROM memory containing a system monitor and the BASIC interpreter language it uses. From there, the optional choices are yours: mini-disc drives (up to two) for saving 160 K per diskette; up to 256 K of internal add-on memory; graphics; bi-directional matrix printer; 11-1/2-inch black-and-white CRT display; game paddles; and a serial out (port) connection for over-the-phone modem hookups with other computers. The computer uses a 16-bit microprocessor (8088), as opposed to the smaller, eight-bit micros used in other machines. The result is compact programming and fast running speed. Naturally, the more you’d like the system to do, the more it costs. For all the IBM options you’d pay $6,000-low by comparable standards; for a “typical” machine with small-business capabilities, about $4,000. Most surprisingly, IBM will initially be using outside sources of software and plans to accept programs from private individualsâ€”a huge departure from past IBM practices. 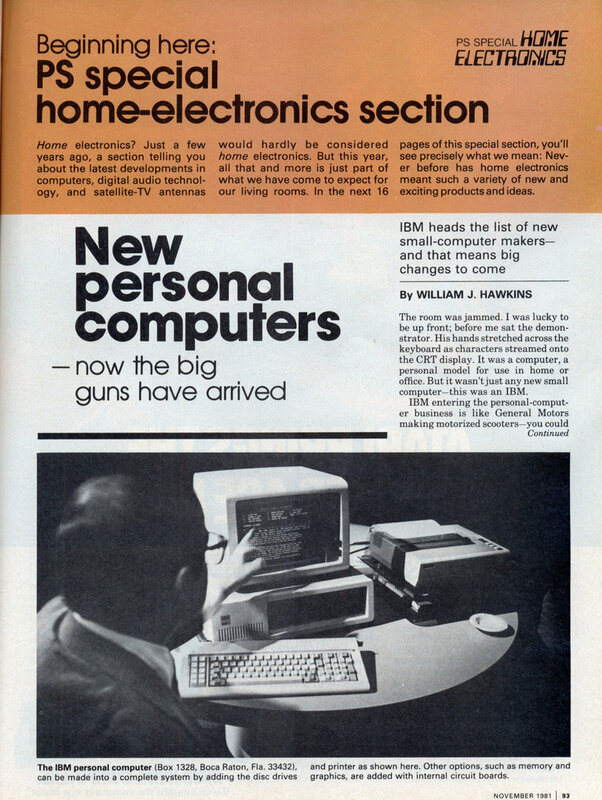 And the computer will be sold not only through IBM special outlets but through Sears business-machine stores and the Com-puterland chain. NEC. Its system starts off simply: an all-in-one box with 32 K of internal memory and output connectors for cassette tape, printer, and video display. (There are two video-display connectors: one for black and white only, another for color.) An additional box, containing a dual mini-disc storage system, holds up to 286 K of information. And, with the drive options, the unit uses Microsoft’s disc BASIC programâ€”a version that’s become so popular it’s considered standard. Speaking of standard, there’s the Xerox model 820 system reviewed in Popular Science last month. Using a standard CP/M disc-operating system, it’s compatible with some 2,000 personal and business programs. The 820 looks and feels totally professional. The keyboard container is bigger than need beâ€”depending on the size of your desk top. But the key placement and tactile response (feel) are excellent. The screen is large; characters are easy to read. The basic system includes the keyboard, display, and mini-disc drives. A rear connection (serial port) lets you plug in the optional printer, included when you order the system as a word processor ($5,895). There is also an optional eight-inch disc drive for large data storage. Casio. This comes as a system, tooâ€” but a lot smaller. It’s about the size of a portable typewriter but much lighter. It contains a keyboard, computer, and CRT display. Data are saved on an external cassette recorder. The right side pops open to expose circuit-board slots. Need more memory? (The computer will tell you.) Just add another circuit board. For text editing the Casio would be limiting because of the cassette storage, small screen, and switch-type keyboard. But for number manipulationâ€”in engineering, the sciences, or accountingâ€”it’s in a class by itself. Upgrade Texas Instrument’s 99/4 computer and you get the 99/4A. It’s basically the same computer except for one important change: the keyboard. The new keyboard uses standard keysâ€”not the buttons on the earlier designâ€”and in a normal typewriter placement. Add to that some 2,000 software programs, and the TI 99/4A is a step above the earlier model. APF’s Imagination Machine has undergone similar modification. The first model APF offered was actually an enhanced video game. You bought the game and plugged it into the optional keyboard-computer to do work. That game has been removed and the Imagination Machine has instantly become a more professional machine. The resulting flat top is for the video display; a built-in cassette recorder can save programs and data. Add-ons, such as a disc system and printer, are attached through a rear connector unit. 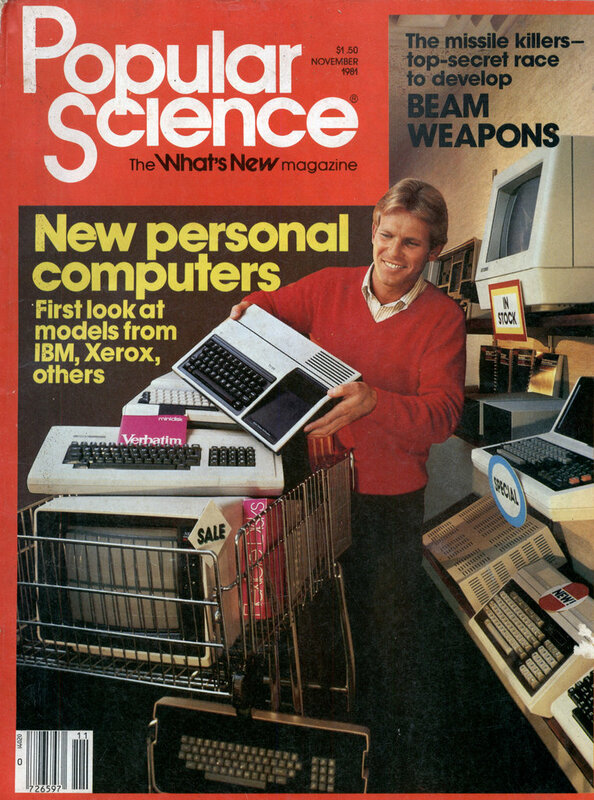 Commodore made headlines and our cover in October 1977â€”by introducing the first home computer for under $600. The company is known for breaking price barriers, and the VIC 20 is its newest ramrod. For its low price you get a lot of computer. It has a touch-typing-quality keyboard, built-in BASIC programming, and an external audio cassette for saving data or programs. Additional connections to the unit allow a printer or disc drive to be added. It also accepts pre-programmed cartridges. The name Osborne is new to computer hardware, but well known for softwareâ€”everything from programs to books on how to program. One idea of the Osborne computer is that you get everything you need in one package for one price: dual disc drives with the CP/M operating system and software, 64 K of internal RAM memory, keyboard, and CRT display. The other idea is that it’s compact and portable. Put the keyboard-cover over the unit, and you walk away lifting the handle. Because of the compact design, however, that small screen is a disadvantage. But if you’re looking for the most computer parts for your money, the Osborne may be it. They still re-branded MS-DOS as IBM PC-DOS! Ohh, I had a TI99/4A. It’s main problem was that you had no way of running your own machine code without buying expensive Assembler cardridges. I still have my Osborne portable.